The star fruit or carambola (Averrhoa carambola), is a unique, waxy, yellowish fruit that has a 5 pointed star shape when sliced. 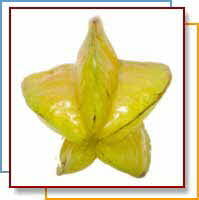 (The most common form of the name is 2 words - “star fruit” - but “starfruit” as one word is also used). A member of the Oxalis (wood sorrel) family, they are classified as subtropical because mature plants can withstand temperatures as low as 26° F for short periods of time with little or no damage. Younger plants are more vulnerable and 32° F can be fatal to them. Seedlings can begin bearing fruit within 3-4 years. Star fruit take about 40-50 days to ripen. The best stage to pick them is when they are just starting to turn from pale green to slightly yellow. The fruit may be seedless or have up to a dozen small ¼” to ½” brown seeds. Once removed from the fruit, the seeds lose viability within a few days. Older varieties bore both sweet and sour fruit on the same tree, but modern varieties have been developed that reliably produce either sweet or semi-sweet to tart fruits. 'Arkin' is the most popular commercial sweet cultivar (although it is rather bland). 'Thayer' and 'Newcombe' are two of the better known tart varieties.